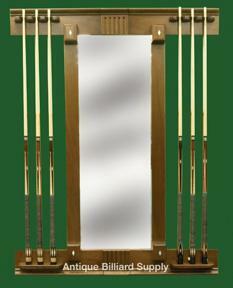 #5-22 Fancy wall-mounted cue rack with center mirror for use with Brunswick antique pool table. Mahogany finish with designs of holly and ivory diamonds. Crown carving provides accent at top center. Holds six cues.